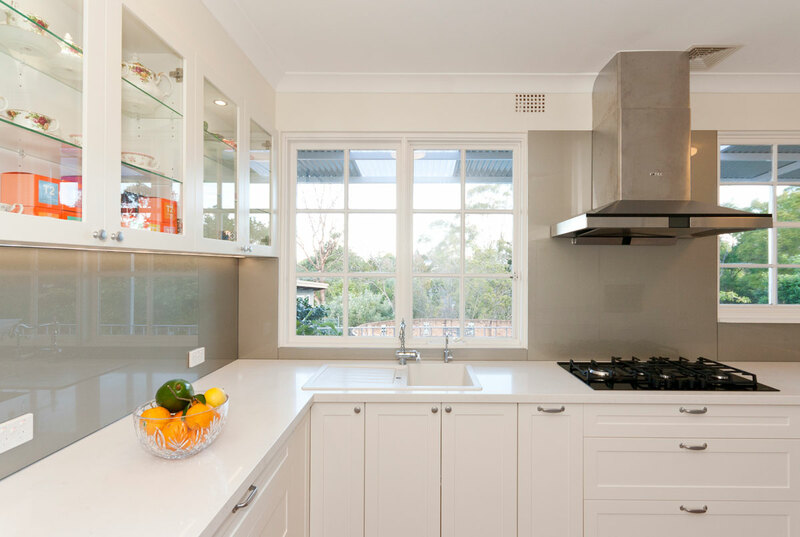 Kitchen cabinet doors and panels are made up of two components – the core board (usually mdf or compact particle board) and the surface layer that is applied to the board. 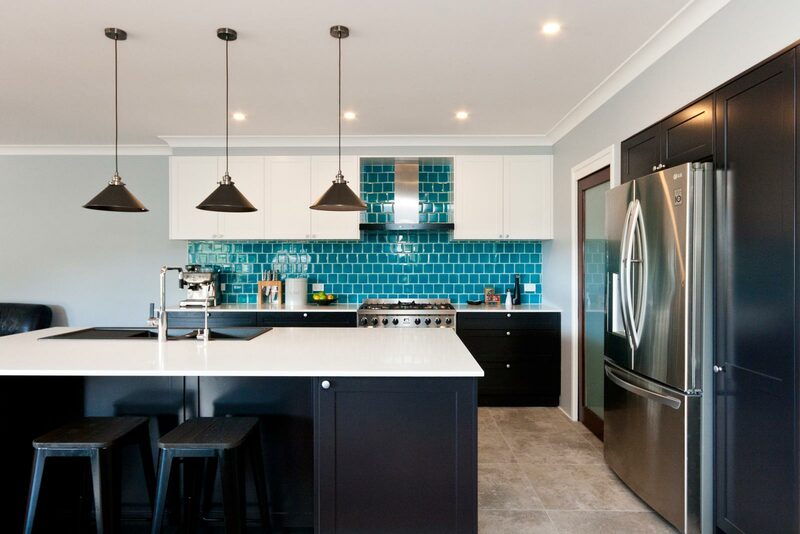 There’s 5 main types of door & panel products available, each with their own benefits and which one you choose will depend on the purpose of your new kitchen, who’s going to be living there and how much money you want to spend. Laminate/melamine is manufactured using thin layers of printed paper which are sealed and protected by thermosetting resins and bonded/laminated onto large sheets of MDF board using advanced high-pressure machinery. These pre-finished boards are then machine cut and edged with matching ABS edging by a cabinet maker or joiner in their factory before installing. Laminates are tough, hard wearing and resistant to heat, moisture & scratching. As technology is constantly improving, so are today’s laminates which are far superior in quality than predecessor versions. Advanced, high-clarity digital printers allow brands like Laminex & Polytec to offer products that mimic natural stone or timber, with textures so realistic you may even mistake it for the real thing. 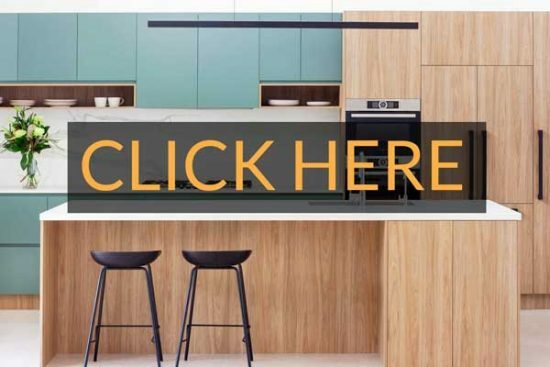 Boasting a large range of colours & prints in different finishes (matte, gloss, textured & super gloss), laminate is one of the most versatile and cost effective kitchen cabinet products available. Pros: Hard wearing, resistant to surface wear, heat (up to approx 180 degrees) and scratching, great for rentals or homes with small children, plenty of colour, texture and finish options to satisfy, least expensive material available (with some exceptions for the higher range laminate products). Cons: Not much. It has an edging applied that isn’t as seamless as polyurethane but that’s about it. Vacuum form vinyl is an MDF substrate with a sheet of vinyl that is heated, wrapped & vacuum sealed around the 3 sides of the kitchen door. This is one product that we don’t support or use in our kitchens as we’ve found that it doesn’t hold up well in environments where heat and/or moisture are present (e.g. heat and steam from ovens & kettles). Pros: Can achieve different shaped door profiles (e.g. shaker, v-groove, federation), seamless finish with no separate edging, moulded in one piece. Cons: Susceptible to heat & moisture damage. Acrylic surfaces (e.g. Ultra Glaze by Polytec) are a cold pressed acrylic foil that’s mounted to the MDF board through a machine lamination process. If high-gloss is what you want, look no further than this super reflective, colour-fade and UV resistant product. Acrylic’s mirror-like finish is one of the most lustrous surfaces available for kitchen cabinets today and looks stunning when paired with a contrasting material in a matte finish. If you’re the eco-conscious type, you’ll be pleased to know that acrylic surfaces are VOC-free, colour pigments are free from heavy metals and it can also be recycled. 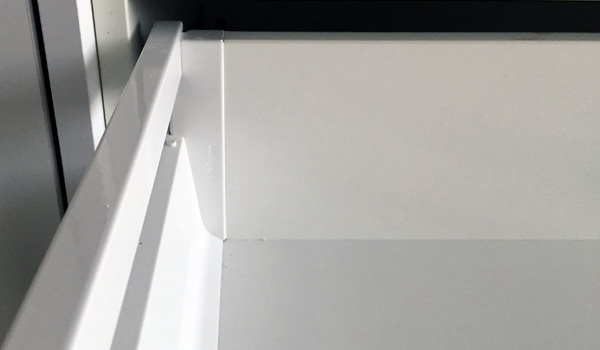 Acrylic surfaces are similar to laminates in that the product cannot be wrapped around corners so the edging is a separate piece that is mounted to the board after the pre-finished panels have been cut down to size. Edging is usually available in 3 different options: matching colour, glass bead or aluminium finish. Acrylics are usually only available in gloss, however some brands have recently released in a low-sheen, satin/matte finish. Pros: Durable & hard wearing, gloss rating of 90% (poly has 60% in comparison), now available in a satin/matte finish, easy to keep clean, UV resistant, different edging available if you fancy something different. Cons: Has a separate edging like all laminates do (not a seamless, wrapped edge finish like poly), limited colour range, can scratch if not cared for properly. Polyurethane (often referred to as poly) is an MDF board that is sprayed with 2 pac paint in either a gloss or satin (matte) finish. There is no need for separate edging with poly as the paint covers the front and sides of the board all at once. Pros: Infinite colour options, smooth consistent edge finish, available in gloss or satin (matte) finish. Cons: Chips easily, expensive to replace, takes longer to manufacture than laminate. Fine sheets of actual timber that are applied to the board’s surface and coated in a clear protective resin finish. Much like laminate only using a real timber product as opposed to a paper-printed one. Pros: Durable, resistant to UV, scratching, staining & moisture, contains real timber so looks and feels authentic. The main purpose of an investment property is to make money and ideally, you want high returns for low spends. Laminate will give you that. 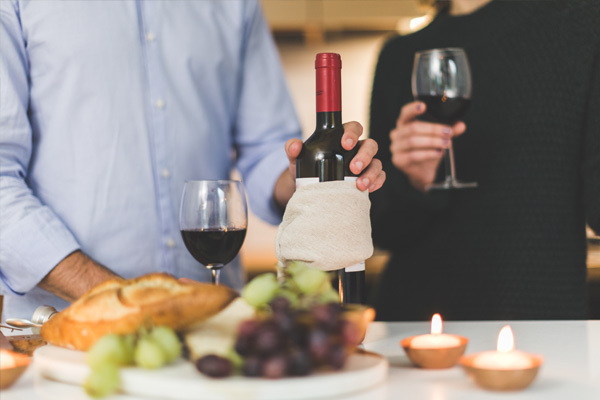 Tenants don’t look after things the same way an owner/occupier would so it’s wise to choose a cabinet material that can take a few hits without needing repair or replacement too often. Laminate is durable & very hard wearing. It won’t dent or chip like polyurethane can. Even if it does happen to get damaged it’s inexpensive to replace. The laminate manufacturing process has come a long way over the years, lasting even longer and withstanding moisture, wear & tear better than ever. With so many colour, texture and finish options available, laminate makes it really easy to get a designer kitchen without the designer price tag. 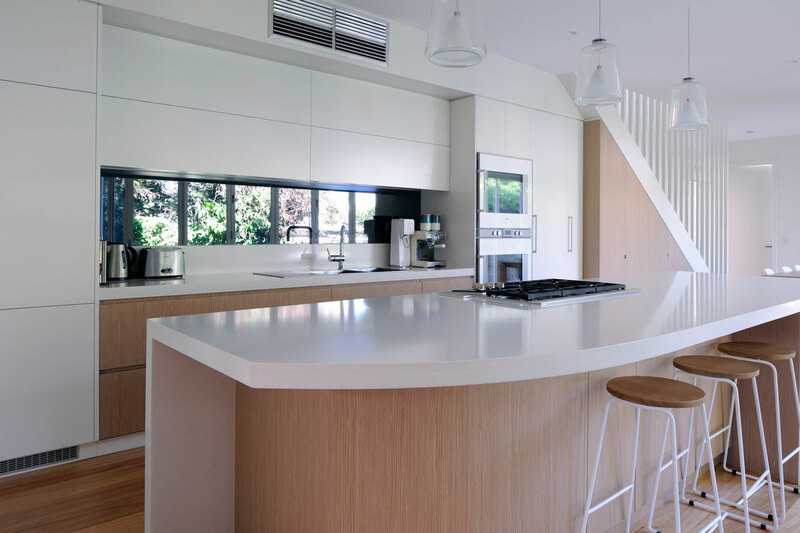 Timber veneer adds a natural, organic element to your kitchen that can be used to create contrast between finishes for a more contemporary design. It also lowers the required maintenance that usually comes with using natural products. Poly is a beautiful finish that wraps seamlessly around the edges of the door panels. The only downsides is that it chips easily if not cared for and it’s expensive to replace. 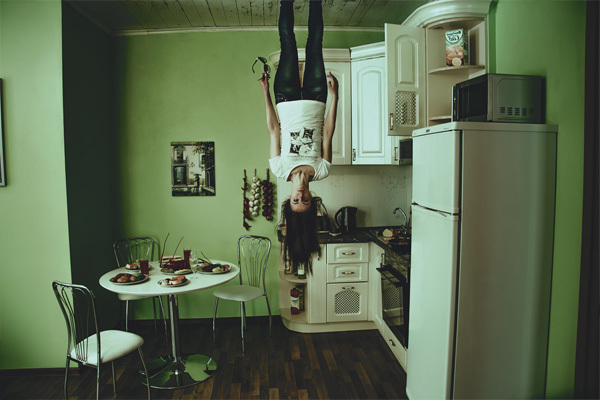 However, when you live in your own home you are more likely to look after things so the risk of damage is greatly reduced (especially if there are no small children running around). Small children and nice things don’t mix. If you bang an object into a laminate or acrylic board, not much will happen besides maybe a minor scratch. Do the same with poly however, and it will chip to reveal the core board beneath it which is not the same colour as the surface. You will notice the defect. 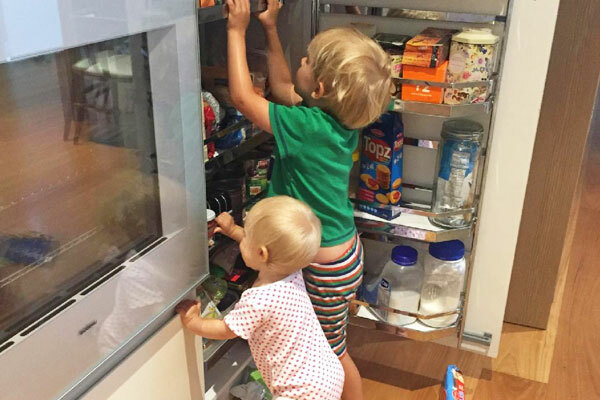 If this doesn’t sit right with you, we don’t recommend choosing poly for lower cabinets in homes with small children who are likely to damage it at some stage. Alternatively, if you’re not keen on a full laminate or acrylic kitchen, why not combine two different materials together? Place the poly up top away from reach of children and the more durable laminate or acrylic on the bottom for the best of both worlds. 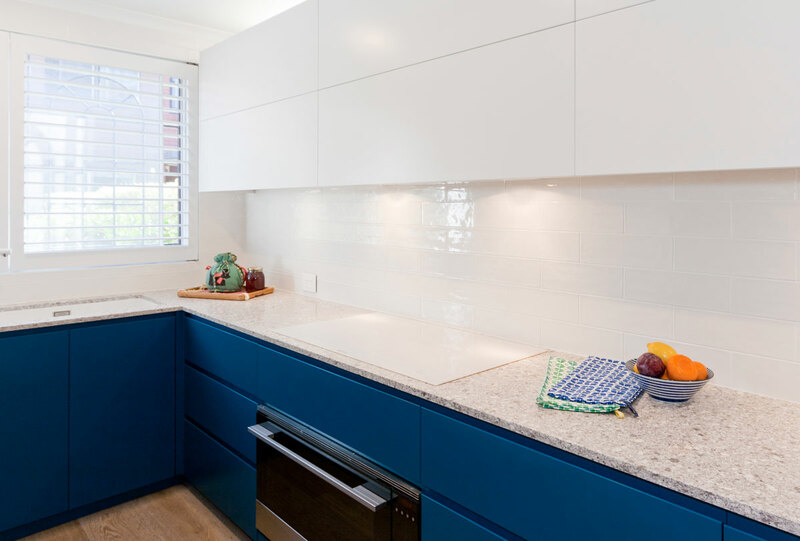 Pairing two different kitchen cabinet materials together in your design can create a striking effect. Contrast can be created as dramatically or subtly as you wish using colour, texture or finish. Once you start playing around with this you’ll open up a world of possibilities. 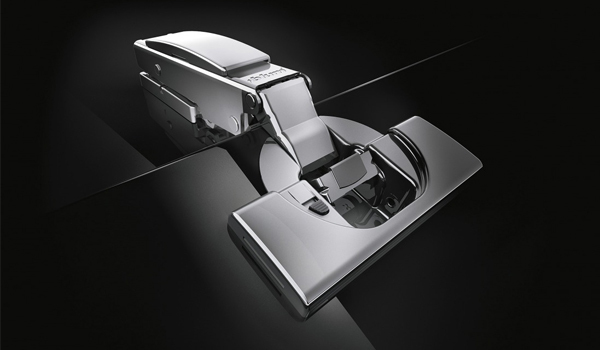 This is where quality really matters and it’s why we use Blum hinges and drawer runners for all of our kitchen cabinets. 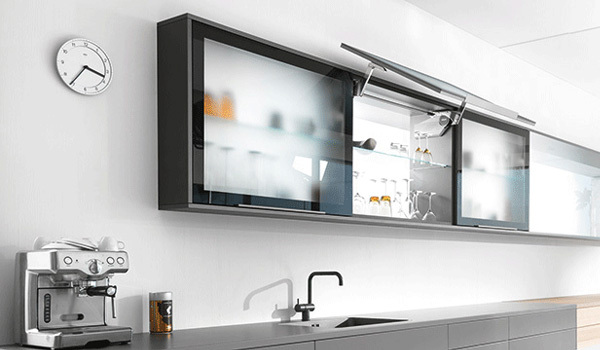 Blum are the industry leaders in cabinet hardware, with a major focus on testing and development so they remain ahead of the pack in terms of quality and innovation. Blum offer a lifetime warranty on all non-electrical parts, and a 5 year warranty on Servo-Drive (automatic/electrical drivers). 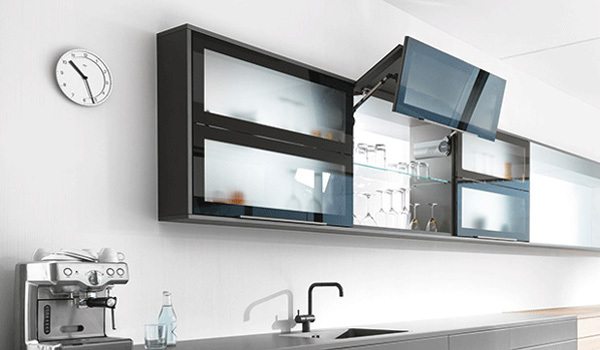 We use soft closing hinges and drawer runners as standard on all of our kitchens at no extra cost and there are plenty of options to choose from if you wish to upgrade. Blum Legrabox soft closing drawer runners are high quality, holding up to 70kg for deep drawers and 40kg for shallow drawers. 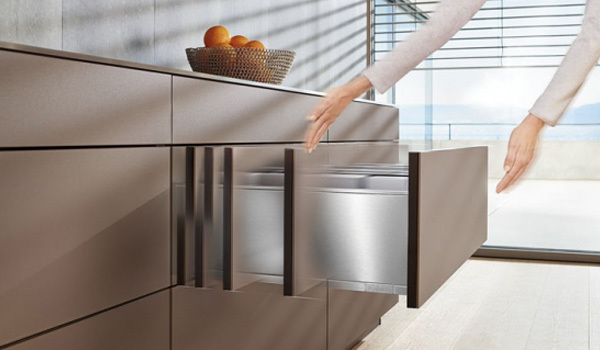 Push to open doors and drawers with a single touch, providing easy access to cabinet interiors. To close, simply press shut. 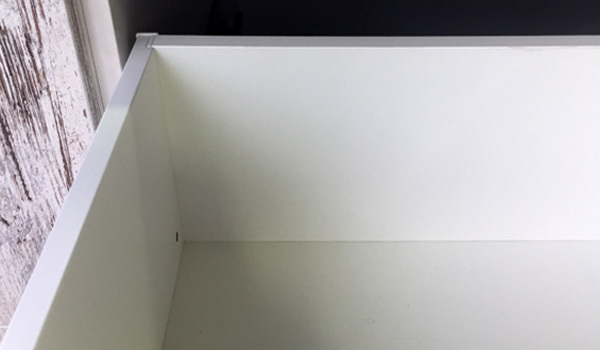 This mechanism allows you to have no handles on any type of cabinet material, however it does mean that you’ll be leaving finger marks behind every time you open or close them. Certain finishes will show marks less than others so talk to your kitchen designer if this is a concern for you. 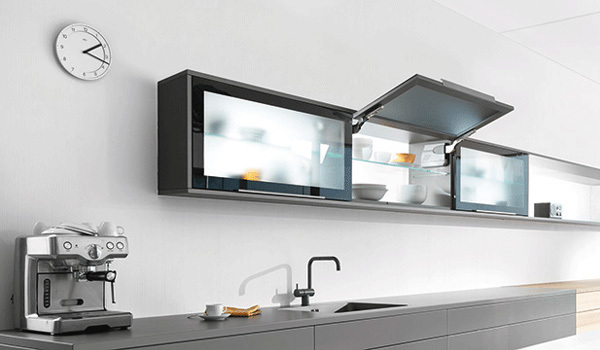 There’s a great range of Blum lift up systems available for overhead cabinets designed to make access a lot easier. Instead of regular doors that swing open sideways, these doors move up & out of the way so you can leave them open without the risk of banging into them with your head. 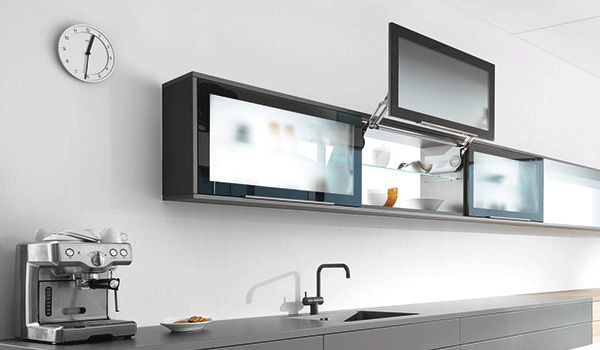 Lift up systems can be operated manually or automatically using Blum’s electrical ‘Servo Drive’ mechanism, which can be particularly useful for high or hard to reach cabinets. To handle or not to handle? That is the question. It’s is a popular choice to ditch the handles all together which compliments a minimalist, modern contemporary or Scandinavian look. However, handles can be used to improve functionality and enhance other styles such as classic, art deco, industrial or french provincial. The type of handle you select is important. Handles are one of the finishing touches that can make or break the style you’re trying to achieve. The right handle has the power to compliment and enhance your kitchen design. Rush this part and you risk upsetting the overall look by choosing a handle that’s too big, too small, too dated or too modern. 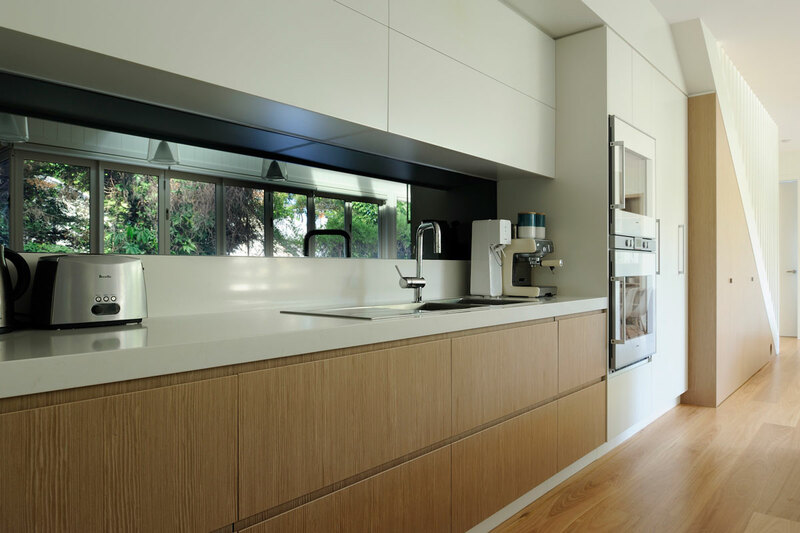 Consider the style, era and size of your kitchen. How many doors and drawers are there in total? If there’s a lot, you might want to choose a more discreet type of handle, or opt for no handles at all to make your kitchen less busy. It’s not only important how they look, but how they FEEL. You’ll be using them daily so pick one that’s comfortable to use. Some have sharper edges that can get a little uncomfortable, especially once there’s some weight in the drawers. Most people prefer a handle with a rounded inside edge for this reason. Think about what’s going inside your drawers, if they’re likely to get heavy you’ll want a handle sturdy enough to operate with ease. Pros: Isolates finger marks to make cleaning easier, gives you somewhere to hang a tea towel, makes full or heavy drawers easier to open, can be used to further establish the desired style or mood. Cons: Depending on the handle type and size, they can make the kitchen look a bit busy. Cons: More fingermarks, constantly needs cleaning, integrated appliances still need to have a handle, as with the pantry and any other full height cabinetry. If finger marks are a concern but you don’t like the look of handles, there are plenty of discreet style handles that are far less noticeable than others, so you can still achieve a minimalistic look without the constant maintenance of cleaning finger marks. Another option is to use discreet handles on the bottom and no handles on top. This is a sensible compromise as it will reduce the busy-ness and potential for messy finger marks at the same time.